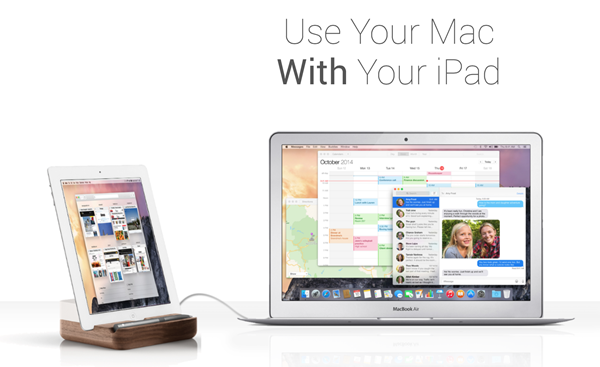 The idea of using an iPhone or iPad as a second display for Mac is not an entirely new one. In fact, as the saying roughly goes, there are many apps for that, but since they connect tablet and computer via Wi-Fi, the lag encountered is rather crippling to the overall experience. One developer has sought to rectify the common problem with secondary iPhone / iPad displays, which at times, feel more like remote desktop than the fluid, connected experiences, by creating a solution that links both parties over USB. Whereas, with Wi-Fi, you’re always going to be hit by that dreaded lag, Duet Display quite literally bridges the gap by connecting via Lightning or 30-pin USB cable. It’s not an absolute remedy to those aforementioned issues, so won’t run as smoothly as a bunch of daisy-chained Thunderbolt displays, but if you’ve ever tried any of the Wi-Fi-based options, you’ll notice a considerable improvement when trying Duet Display for the first time. Created by a former Apple Engineer, Duet Display offers two main modes – Retina Mode and non-Retina Mode. The former, as you’d imagine, is sharper, but at the expense of smoothness, while the non-Retina option offers less lag yet also less detail. You also have the option to set the frame rate at 30 fps or 60 fps, and if you’re using an older iPhone or iPad, it’s probable that its internal hardware won’t be able to cope with the strain of the higher settings. Provided you own a Mac, iPhone or iPad and a USB cable to connect the two, you can get started with Duet Display, which will also require the download of apps for iOS and OS X. It should be noted that while Duet Display is a neat option for those really in need of that additional real estate, it’s far from ideal, and not only will you still get lag, but it may put significant strain on the resources of both your Mac and your iPhone / iPad. But, it’s nonetheless a step in the right direction, and with configurable modes and frame rate options, you can definitely make the best of this app and enjoy a second display wherever you may be. The Mac app is free, while the iPhone and iPad app costs $9.99 for a limited time. Within 24 hours, it’ll rise to $14.99, so if you’re deliberating, you should probably make your decision sooner rather than later. Its not a bad app and propz for making an article about it, i use it fairly often. The only complaint i have is the iPad screen is a little small. I prefer a 27" display connected by thunderbolt, but to perhaps have an extra screen for something taking up needed room on Mac its great. The other negative issue i shall bring up is the fact that whenever an idevice is connected via USB to a Mac it automatically charges. This means that if your Mac isn't plugged in to the mains then your battery power is now not only displaying an extra screen but also charging the device as well. Fairly often i have seen my battery drop by 40% in around an hour simply because i want to use duet. If i want to use USB tethering through my iPhone on one side and duet on the other side then my Mac may as well be torn in two as the main battery is charging 2 devices and trying to be operational.